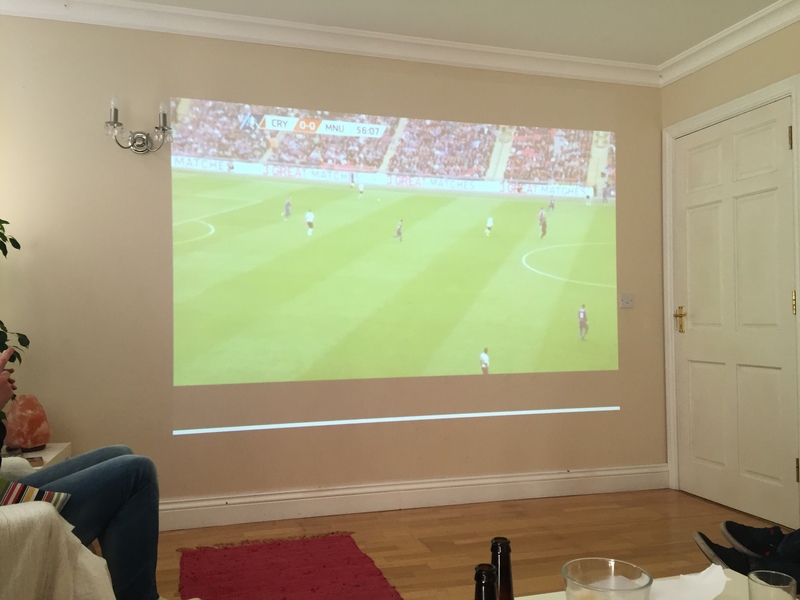 As the dust settled on an ultimately disappointing outcome at Wembley on Saturday, this is how my day unfolded. The sunlight peered through the crack in the blinds and woke me from my slumber. It takes me eight or nine seconds to come to terms with my surroundings, before then being jolted into another realisation – it is FA Cup Final Day. Finally. I leap up with a distinguished spring in my step. Six seconds later I had to sit down again. My head was spinning. Never leap out of bed like Shefqi Kuqi without doing the necessary groundwork. Having composed myself, I politely climbed out of bed, the excitement started to build. Downstairs, my nephews are bellowing. I grab my scarf and walk down to the breakfast table, where an egg and meat feast awaits. Flanked in red and blue balloons, the breakfast went down a treat. By now, I have been solidly pacing around the house for almost an hour, navigating the minefield of lego pieces strewn across the floor, clutching desperately to a cup that is close to seeing its tenth refill of the morning. The churning in my stomach is not relenting. Maybe I will get another cup of tea – that might sort it. ‘Whatever you do, do not let go of that cup’, I keep thinking. We are all bundled into a car. Heading to the venue early, apparently, as my oldest nephew struggled to contain his excitement. My own nerves and excitement were matched only by his enthusiasm. There are a surprising amount of people at the venue already. I thought we would have a bit of time to soak up the atmosphere on our own but it appears many others anticipated the same. Families are lining up to get photos with each other outside. There is a real sense of occasion already and it is still only the morning. Such a long day ahead and the nerves are incrementally increasing. We are ushered inside by the powers that be outside. It is not as busy as expected, but the place is bristling with the mutterings and playful conversations of excited children. We take our seats and at the clang of a bell, we are underway…… This is not Wembley. 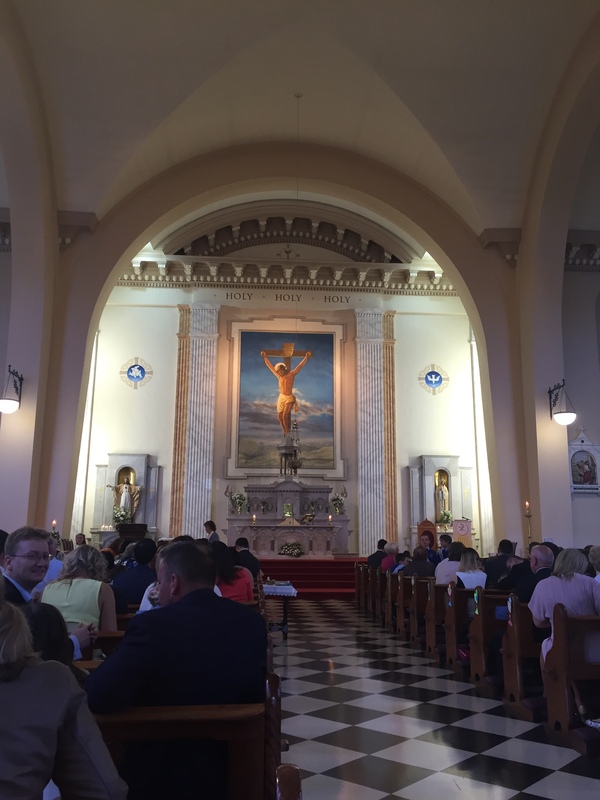 It is a group of children making their first holy communion in Bantry, West Cork. An altar boy strolls nonchalantly past the pew I have attached myself to. He is sporting a smelly ball at the end of a chain. I am trying to fathom what is inside. Is it merely a scent with some artificial smoke to give off an air of mystic, or have the Church endangered the life of this innocent child, dressed like a Manchester United fan, by asking him to carry a flaming ball whilst ensuring he remembers his lines. My concerns about the welfare of that child are not enough to allay my nerves. It is still Cup Final day. This is not Wembley. Apparently we are approaching the end of the first half. Not so much action yet. A solid performance from the players so far with the kids not putting a foot wrong. Their lack of experience today was a concern of onlooking parents, but they clearly have not let the occasion get to them. The chief orchestrator and religious conductor is the priest. He looks a bit like Sean Dyche and seems prone to a two-footed tackle. He sees the first half out by warbling on about the importance of the alphabet. Ten minutes ago a kid delivered a masterful reading demonstrating a startling command of the alphabet. It becomes clear to me that the priest is in danger of losing control of this game. Second half underway, the priest has regained his composure somewhat, although now blasts into a song. His pitch and tone are all over the place. He sometimes sounds like Sean Dyche. He sometimes sounds like Susan Boyle. For the most part, he still looks like Sean Dyche. Remarkably, the ceremony comes to an unexpected end. During communion, Fr. Sean Dyche raises a cup over his head proclaiming himself to be the body of Christ. From here he looks like David Hopkin. I try to take a snap of Hopkin lifting the Cup, but I am foiled by one of the Church’s agents in the stands. They were tipped off about potential crowd trouble. I am politely told to put the phone away. Behind the altar, Jesus is nailed to a cross. I grab a photograph when the hardline agent is not looking and my mind reverts to the game later. Seeing Jesus go up for the cross convinces me that Scott Dann is going to score first from a corner. I proclaim this too loudly to my brother-in-law. The undercover catholic does not appreciate my jesting at Jesus’ crucifixion. We visit the primary school where it all started. Either I am not four feet tall anymore, or this building is much tinier than remembered. I suspect it is a combination of both but am too focused on the cake and scones they have been laid on for the occasion. I thank everyone for being so generous to me on account of it being FA Cup Final day. They stare at me blankly. I am asked to pre-record an interview on Radio Kerry as part of their Cup Final build-up to be aired shortly before kick-off. I feel like a celebrity. Gary O’Sullivan rings and we have a good chat. I take the opportunity to pretend I am knowledgeable, have a subtle dig at the sense of entitlement Manchester United (and Newcastle) fans have, and boldly claim Palace will win 1-0 with a late goal from substitute Dwight Gayle. First beer of the day. We are back in the house now and looking forward to the game at 5.30. I keep refreshing my phone to keep an eye on any team news. 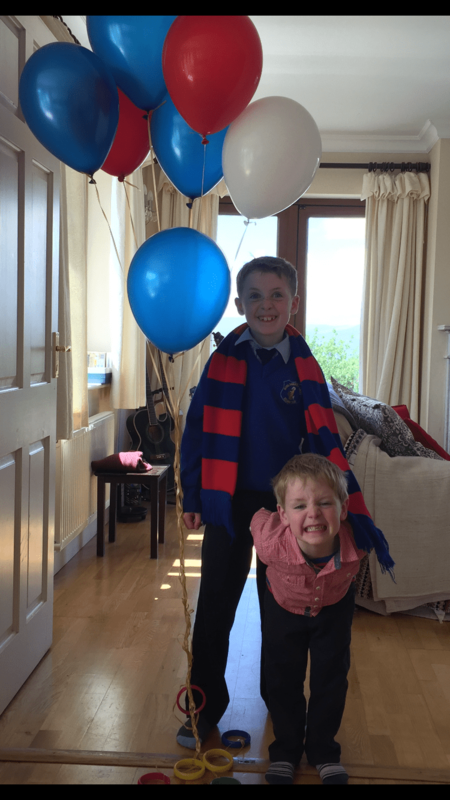 Charlie poses for a picture with his brother Harry, next to a carefully positioned stream of balloons. They tell me they want Palace to win. I am not sure they sense the importance of it all, but their words are heart warming. I post the fearsome picture of my red and blue nephews on Facebook. The millions of Irish based United fans in my network are terrified. The text messages start to come in. For many, I am the only Palace fan they know. Most of the Palace fans in West Cork emigrated in 1367 when the IT industry in Ireland collapsed. I say this to my brother-in-law. He tells me it is a lie. My heart is warmed by the messages of good luck. It is clear all the neutrals are craving a Palace win. I am beginning to increase my alcohol intake. Pictures and videos of friends at Wembley begin to surface. It looks like Palace are taking over. The countdown to kick off is on. My Palace supporting Uncle stops in for a beer. He has turned into Rory McIlroy and miraculously and unexpectedly qualified for a golf tournament clashing with the game. The beer is both a comfort and a performance enhancement. I think about contacting WADA, so he might be able to watch the game through the lens of a cup to urinate in. I tell myself it is a stupid idea and put the phone down. I drink to calm the nerves. People who do not get the gravity of the day begin to annoy me. I black out the windows and get the projector ready. I tell my family to expect strange noises coming from the room. Do not be alarmed. Do not adjust your television sets. There is nothing to see here. My pre-recorded interview airs on Radio Kerry. I tune in because I love the sound of my own voice. I am pleased. I talked sense. I wait for the outpouring of congratulatory texts to come my way. Nobody texts. I grab another beer. Unbearable nerves. Abide With Me. Goosebumps. Pictures from the stands symbolise everything it means to the Palace faithful. ‘This Mentality is Unstoppable’. First half over. I am struggling to contain anger. Clattenburg has been called every name under the sun. Don’t tend to dwell on refereeing decisions, but this has riled me. He has made errors – huge errors. My cousin Eoghan joins for the second half. He is a big Palace fan too. He tells me he broke the speed limit to call in and catch the second half. Knowing his parent’s might be reading this, I told him I was doing a diary and would say he travelled at forty kilometres an hour for the whole journey, stopped along the way to help an elderly woman cross the road, gave CPR to a dying crow and studied for his exams all day despite the searing heat. He told me he had given me €20 to say this. I did not receive the money. Puncheon scores. I don’t react. I clap politely and commend him on a fine strike. OMG. THIS ISN’T HAPPENNING. Neighbours are alerted to piercing shrieks coming from the Curran’s house. 1-0 Palace!!! Chris Smalling channels his inner rugby player and hauls Yannick Bolasie down. Red card. Palace need to push on. I continue my drinking unabated. Jesse Lingard breaks my heart. Final whistle. I am absolutely devastated. United probably edged on the balance of chances and quality of play, but Palace through Bolasie, Zaha, Gayle and Puncheon all had opportunities to push us on and give us a remarkable victory. The noise from the stands permeates through my makeshift theatre and the sense of devastation remains, but the pride at being a Palace fan and being attached to a club as spectacularly devoted as this shines through. The messages of commiseration start coming through. I increase the pace at which I am devouring beers. I begin to think that keeping an ‘Alternative FA Cup Final Diary’ was a waste of time. Entitled and insufferable United fans start coming out of the woodwork again. Where were you all season, guys? I am in the Anchor Tavern in Bantry. Teeming with United fans. I know I have made a huge mistake by leaving the comfort of my sister’s house. One United fan tells me Puncheon’s goal was a fluke. I walk away. Anyone but them. Idiots.